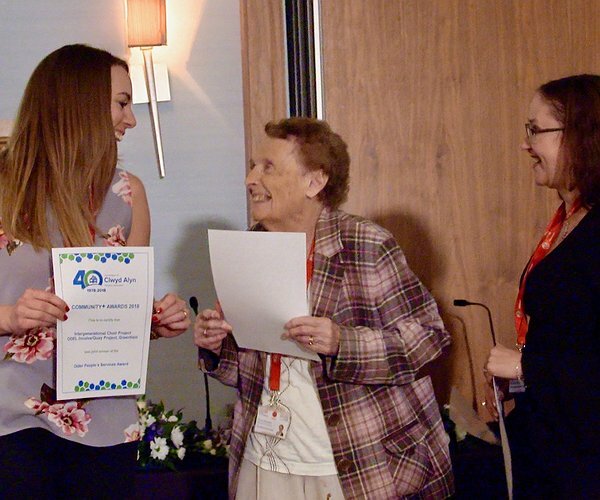 Schemes supporting residents across Flintshire have been presented with ‘Community Plus’ Awards at the annual meeting of Clwyd Alyn Housing Association. As well as recognising all sections of the housing and support services, the overall winner of the ‘Mrs Eurwen Edwards Award,’ named in honour of the Association’s Honorary President and Founder Member, was the ‘Beyond the Boundaries’ Team based at the Llys Eleanor Extra Care scheme in Shotton. Beyond the Boundaries is a social enterprise offering tenants therapy treatments such as head or shoulder and neck massages, reflexology, and hair and nail treatments while also offering independent living skills to young adults with additional needs. Awards were presented by Mrs Edwards, along with Louise Blackwell, Community Development Officer for Clwyd Alyn. The Erw Groes Family Centre in Holywell won the ‘Supported Living Award’ for their Sensor Play Centre which provides a specially designed safe sensory area helping children and young people to relax and remain calm and the Sensory Garden at Greenbank Villas in Flint was named as ‘Runner-up’ in this category. The ODEL Involve advice and support service, based at the Old Court House Café and Community Hub in Flint was a joint winner of the ‘Older People’s Services Award’ for an innovative inter-generational choir initiative where residents from Supported Living Schemes teamed up with residents from extra care schemes in the area. Residents from the Nant Mawr Court Sheltered housing Scheme in Buckley were named as ‘Runner-up’ in this category recognising their hard work improving communal garden areas at the scheme. The Care and Nursing Homes Award was presented to Chirk Court in Chirk for its commitment to supporting a Dementia Friendly community in the area. The Maes Eithin Community Event in Rosehill, Brynteg won the General Housing Community+ Awardand the Community Garden and Internet Communication Project at Cae Glo in Wrexham was joint runner-up in the Older People’s Services category. The Inspirational Volunteer Award was won by Lauren Williams, a tenant at Isallt, Llandudno and the runner-up a was the llys Alyn Enhansing Lives Project in Rhos-on-sea.